"The night of the summer solstice. Girl picking the fern bloom" from the series "Ukrainian folk songs." Oil on canvas. Chicago, IL. -In 1963, at the Monolith Exhibit of Contemporary Ukrainian Artists in Chicago, the art world got its first glimpse of an artist who would ultimately make profound contributions to the world of Ukrainian Modern Art. Four decades later, we are celebrating that contribution and the body of work that it produced. We are pleased to present to you the work of Aka Pereyma: 40 Years of Creativity. From April 10th until May 22nd, 2005, the Ukrainian Institute of Modern Art will display the work of Aka Pereyma. Visitors will have the opportunity to experience the talent of this multi-layered artist through a comprehensive exhibition of her drawings, watercolors, oils, mixed media, sculptures and ceramics. Aka Pereyma has had a distinguished career as an artist and has earned a number of awards recognizing her originality of composition, perfection and depth of detail, richness of color and her certainty of vision. For her contribution to Ukrainian cultural identity, Ms. Pereyma received the Outstanding Ukrainian Artist medal awarded by the government of Ukraine in 2001 and in 2004 she won the Ohio Heritage Fellowship for her artistry in ceramics and pysanky. The exhibit will open on April 10th. The opening reception will be held on April 24th from 1 to 6 p.m. At the reception. the artist will give a presentation about her work starting at 4 p.m. 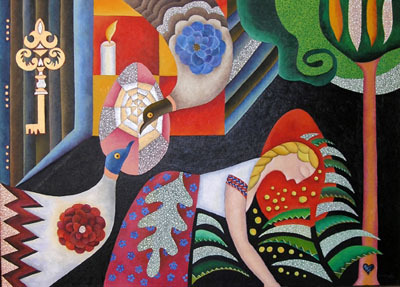 The Ukrainian Institute of Modern Art was created to preserve and promote the knowledge and appreciation of contemporary Ukrainian art and culture. It serves as an artistic anchor in Chicago's West Town community, providing world-class art exhibitions, concerts, literary readings, and educational and cultural exchanges. UIMA is located at 2320 W. Chicago Ave, Chicago, IL telephone 773-227-5522. The Institute is open Wednesday through Sunday from 12:00 p.m. to 4:00 p.m. For more information about this event please contact Lialia Kuchma, Chair of the UIMA Art Committee, at 773-227-5445 or visit our website at www.uima-art.org. Opening Reception: Sunday, April 24, 2005, 1 p.m. to 6 p.m. Presentation by the Artist: Sunday, April 24, 2005, 4 p.m.
Gallery Hours: Wednesday to Sunday, noon to 4 p.m.